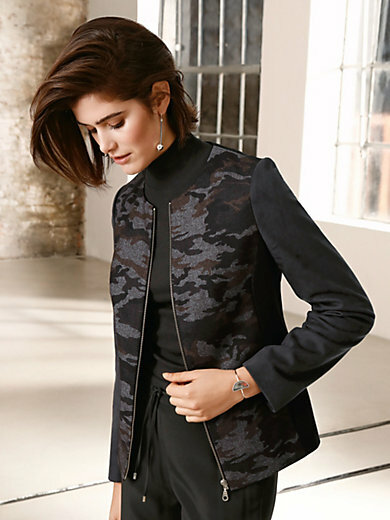 Jacket by LOOXENT: trendy, sporty and figure-­flattering! Material mix in 55% wool, 45% polyester. Trendy camouflage print. Plain jersey inserts for a slimming effect in 65% viscose, 30% nylon, 5% elastane. Imitation suede on the upper sleeves in 92% polyester, 8% elastane. Front lining in 100% acetate. Length approx. 24ins. The jacket should be dry cleaned.